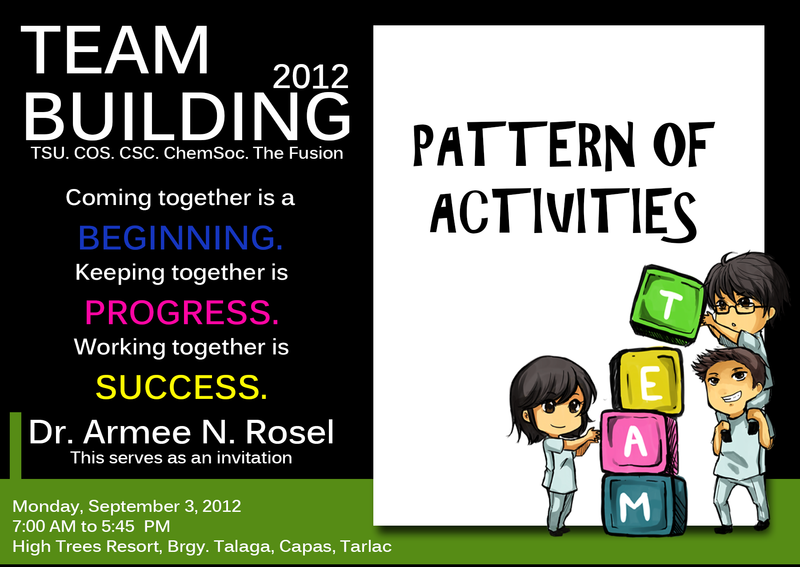 This invitation was designed for the annual team building of COS Student Council, Chemical Society and The Fusion. 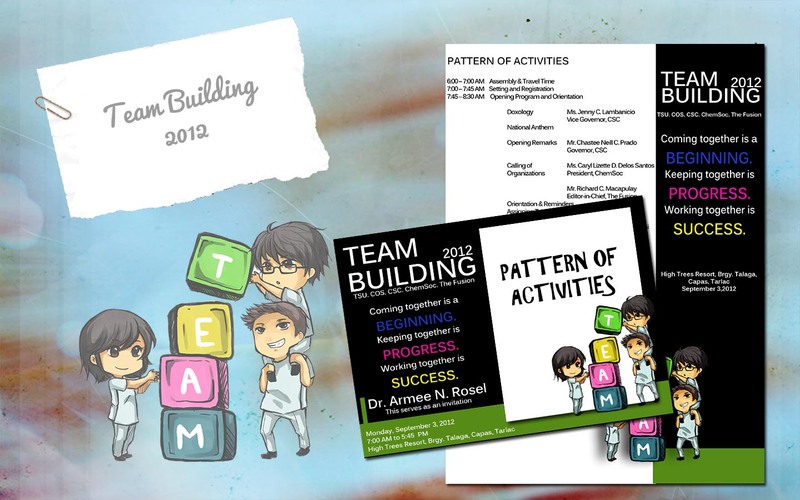 The team building was the first activity conducted wherein the three major organizations of the college were gathered with one goal – to strengthen the bond between the leaders and members of each organization. During that time, the Metro design of Windows was being introduced to the public. As you may guess, it is the primary design inspiration of this invitation – the bold colors and minimalistic details. The three students in white down there piling up blocks to construct the word “TEAM” is again drawn by Iris Faye Hernandez, one of the technical officers of the student council. Ms. Faye is also the artist behind the Freshmen Orientation project. 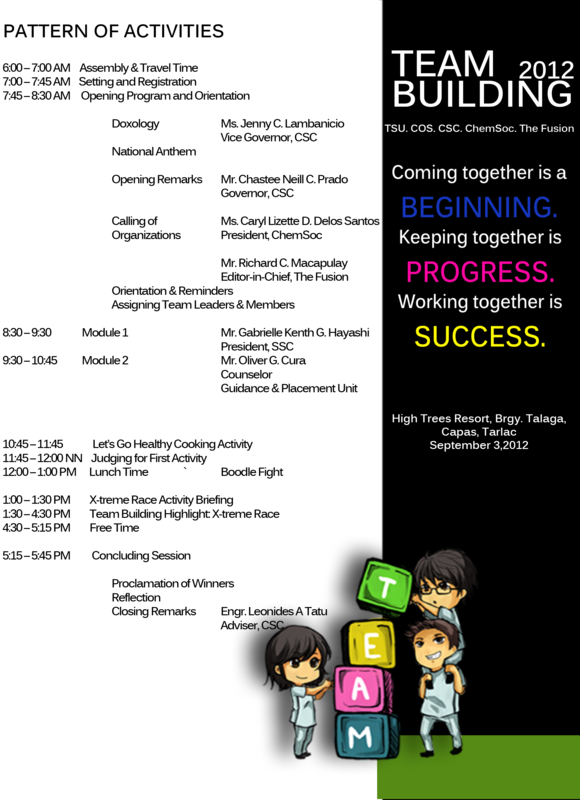 The three organizations namely: College Student Council, Chemical Society and The Fusion were invited to join the event. The whole event is spearheaded by the student council. The team building is meanwhile supported by the Supreme Student Council, University Guidance Unit and the college faculty itself. The event was scheduled late July but it was conducted as late as September due to fund and venue issues. Chemical Society is the official organization of chemistry students not only in Tarlac State University but on all schools that have BS Chemistry course. The Fusion is the official college publication of the College of Science, TSU.